Building a site that you want to be a web app on an iPhone, iPad, or iPod Touch? If you add this to your Mobile Safari web page your page will open in full screen mode… IF you added your page as a shortcut to your Home screen and IF you launched it from that shortcut! 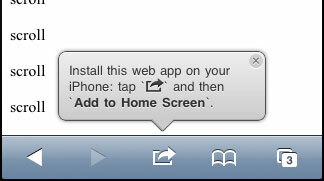 Otherwise if you open the page from the standard mobile Safari icon it will not be in full screen! You might have seen how some sites have a popup balloon that points to the button with a message on how to add to the Home screen. The popup only shows up when your not in full screen mode. How do they do this? If this property is true, we are in full screen. False, we are not in full screen! // properly on the screen. Do you want to look into this subject in more detail? Ben Nadel has written an excellent post on his blog: Detecting iPhone’s App Mode (Full Screen Mode) For Web Applications. The JS Library is downloadable for free but Matteo will take donations via PayPal or Flattr. Code. I have to say I downloaded the library and looked at the code. Matteo put a lot of effort into this thing. it supports multiple languages and does all sorts of fancy stuff! Enough said.